After working with the Egyptian Air Force on engine training for their Falcon 20, Engine Tech Rep Shane Heier and his wife Katie took a few days to travel Egypt. Duncan Aviation provides emergency AOG support to grounded aircraft nearly anywhere in the world, making hundreds of service trips a year. In 2010, team members traveled to some of the most exotic locales including such places as Puerto Vallarta, Mexico; Guayaquil, Ecuador; Merida, Mexico; Cairo, Egypt and St. George, Bermuda. While providing the most-needed AOG services to our customers at their location, team members also took in some local culture, food and sites. In the spring of 2010, avionics tech Gene Dannenberger flew from the Duncan Aviation avionics satellite shop in Sacramento, Cal., to Puerto Vallarta, Mexico, to install a Duncan Aviation repaired radar system in a Jetstar. While there, Gene took advantage of the wonderful weather to become a sightseer at many of the local tourist spots including downtown Puerto Vallarta, the marina and of course, the beach. While performing this routine maintenance, he was entertained throughout the day with music playing in some nearby trees and was visited by a couple of armed airport guards who came out to watch the radar change. A quick trip to Ecuador for one Duncan Aviation Engine Rapid Response Team (RRT) technician turned out to be more than expected one day in July. After arriving, Karl Johnson, Rapid Response Team Leader from Fort Lauderdale, Fla. went to work troubleshooting the squawk and quickly discovered a faulty oil pump. James Holmes, an engine tech also from the Fort Lauderdale RRT, hand-delivered the part in order to complete the project on time for the customer. Together they completed the maintenance and headed back to Florida, arriving at 6 a.m. the next morning. In reflection, Karl admitted that the trip was too short and had he been able to stay longer would have visited a local establishment known for having great steaks. Karl's trip to Central America didn’t end in Ecuador. He took three separate trips to Merida, Mexico in a span of about two months. What began as a fuel control change turned into troubleshooting for a compressor stall. Finally, the project came full circle with an engine change two weeks later. If he ever gets the opportunity to return, Karl hopes to visit the Mayan Pyramids. Shane Heier, an Engine Tech Rep out of Lincoln, Neb. traveled over 4,000 miles to Cairo, Egypt not once, but twice in 2010. For six days in the heart of the Arabian Desert, Shane’s first trip provided the Egyptian Air Force LRU training for the Honeywell TFE731-5BR engine on their Falcon 20. Taking advantage of his time in Egypt, he and his wife Katie stayed an extra couple days traveling the region and exploring a land rich in history. Their adventures took them to the Pyramids of Giza, the Cairo Museum, a church in Coptic Cairo and a visit to the Alexandria Library of Alexandria located along the Mediterranean Sea. A month later, Shane got the chance to visit Cairo again and was accompanied this time by Jeff Sikes, RRT engine tech from Scottsdale, Ariz. Duncan Aviation's Rapid Response Teams support AOG engine emergencies in addition to most scheduled and unscheduled events, including engine changes and that is exactly what brought the two to Cairo. They were dispatched to change an engine for a Dassault Falcon 20 aircraft onsite. 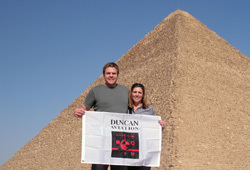 Shane’s time in Egypt was an experience he will not forget and remarks that he would visit again if given the chance. A quick trip to change an igniter box meant a short get away for Engine Line lead technician, Eric Perez. Eric was dispatched from Lincoln to St. George for work on a Falcon 50EX. The trip was short, not allowing much time for sight seeing, but Eric enjoyed his stay at Grotto Bay Beach Resort and the chance to experience the beauty of Bermuda. Erin Hart is a Duncan Aviation Apprentice working in the Marketing Communications department at the Lincoln Nebraska facility. She began working in aviation in 2007.